JJ, A Women in Business expert, empowers audiences to take action with best practices offering women, male allies, & diversity initiatives with an energetic approach to leadership & gender inclusion. JJ delivers engaging discussions with action-based strategies for women (and men) who are aspiring to increase their leadership and impact. Her topics are ideal for Corporate Women's Groups, Diversity & Inclusion meetings, and Managers & Recruiters looking to hire more women. As the leader of Tech Savvy Women, a group of 3,000 experienced women in technology roles or organizations, JJ is invited to share her research and expertise with many companies including Amazon, Ingram Micro, Cisco, ForeScout, VMware, IBM, KeyBank, and Rockwell Automation. 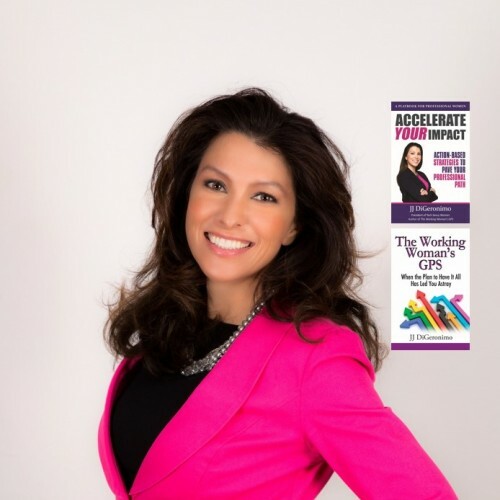 The backdrop often includes materials from her 2016 award-winning book "Accelerate Your Impact: Action-Based Strategies to Pave Your Professional Path" which complements her 2011 book, "The Working Woman's GPS: When the Plan to Have It All Leads You Astray." Her work is featured in Forbes, Inc. Magazine, Thrive Global, and The Wall Street Journal. With fantastic testimonials, multiple invitations, and award-winning books, JJ walks her audiences through pointed worksheets, strategies, and best practices that enable audiences everywhere to convert her research into tactics that aid in Leadership Development, Recruiting and Retaining Talent, and Inclusion practices to help increase gender diversity throughout organizations. Find out more about JJ DiGeronimo, Women in Business & STEM at https://www.techsavvywomen.net/.